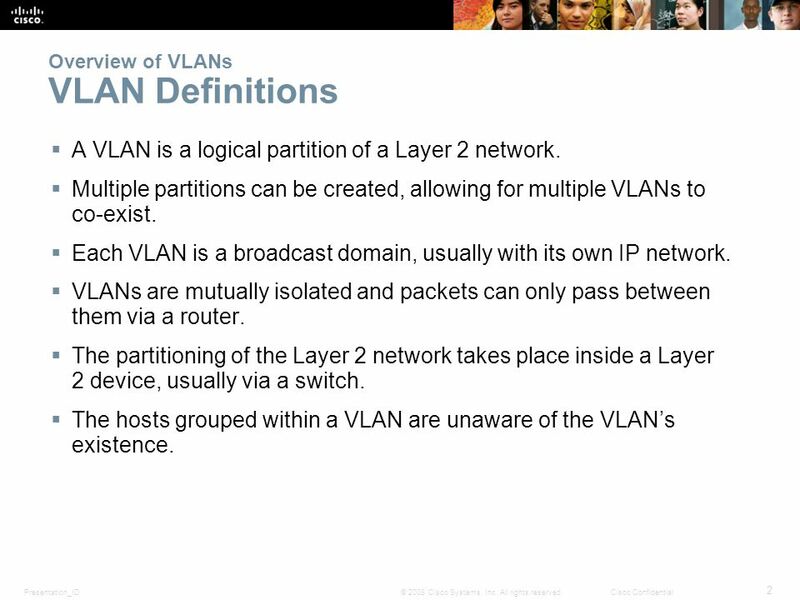 2 Presentation_ID 2 © 2008 Cisco Systems, Inc. All rights reserved.Cisco Confidential Overview of VLANs VLAN Definitions  A VLAN is a logical partition of a Layer 2 network.  Multiple partitions can be created, allowing for multiple VLANs to co-exist.  Each VLAN is a broadcast domain, usually with its own IP network.  VLANs are mutually isolated and packets can only pass between them via a router.  The partitioning of the Layer 2 network takes place inside a Layer 2 device, usually via a switch.  The hosts grouped within a VLAN are unaware of the VLAN’s existence. 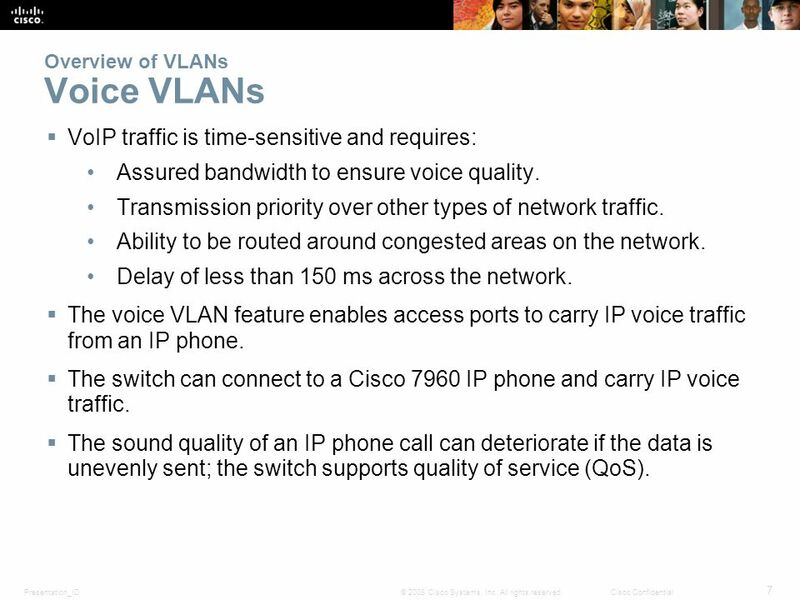 7 Presentation_ID 7 © 2008 Cisco Systems, Inc. All rights reserved.Cisco Confidential Overview of VLANs Voice VLANs  VoIP traffic is time-sensitive and requires: Assured bandwidth to ensure voice quality. Transmission priority over other types of network traffic. Ability to be routed around congested areas on the network. Delay of less than 150 ms across the network.  The voice VLAN feature enables access ports to carry IP voice traffic from an IP phone.  The switch can connect to a Cisco 7960 IP phone and carry IP voice traffic.  The sound quality of an IP phone call can deteriorate if the data is unevenly sent; the switch supports quality of service (QoS). 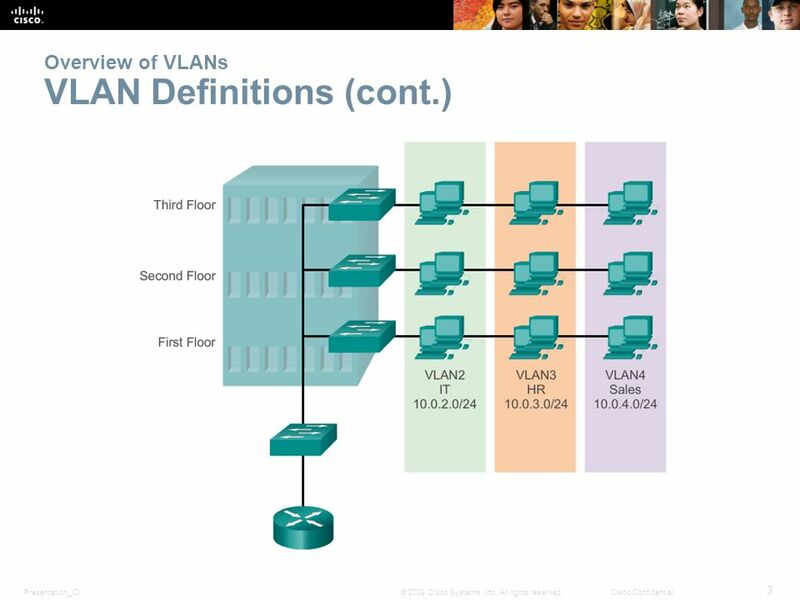 8 Presentation_ID 8 © 2008 Cisco Systems, Inc. All rights reserved.Cisco Confidential Overview of VLANs Voice VLANs (cont.)  The Cisco 7960 IP phone has two RJ-45 ports that each support connections to external devices. Network Port (10/100 SW) - Use this port to connect the phone to the network. The phone can also obtain inline power from the Cisco Catalyst switch over this connection. Access Port (10/100 PC) - Use this port to connect a network device, such as a computer, to the phone. 10 Presentation_ID 10 © 2008 Cisco Systems, Inc. All rights reserved.Cisco Confidential VLANs in a Multi-Switched Environment VLAN Trunks  A VLAN trunk carries more than one VLAN.  A VLAN trunk is usually established between switches so same- VLAN devices can communicate, even if physically connected to different switches.  A VLAN trunk is not associated to any VLANs; neither is the trunk ports used to establish the trunk link. 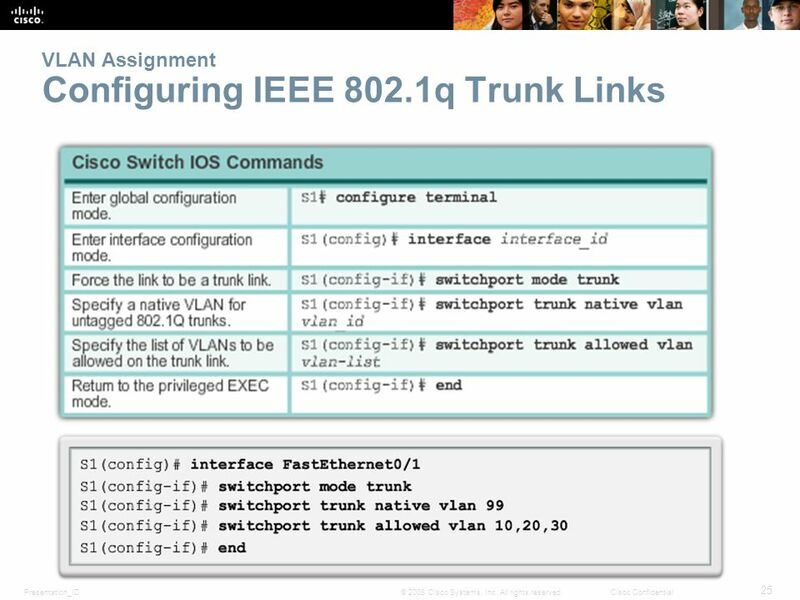  Cisco IOS supports IEEE802.1q, a popular VLAN trunk protocol. 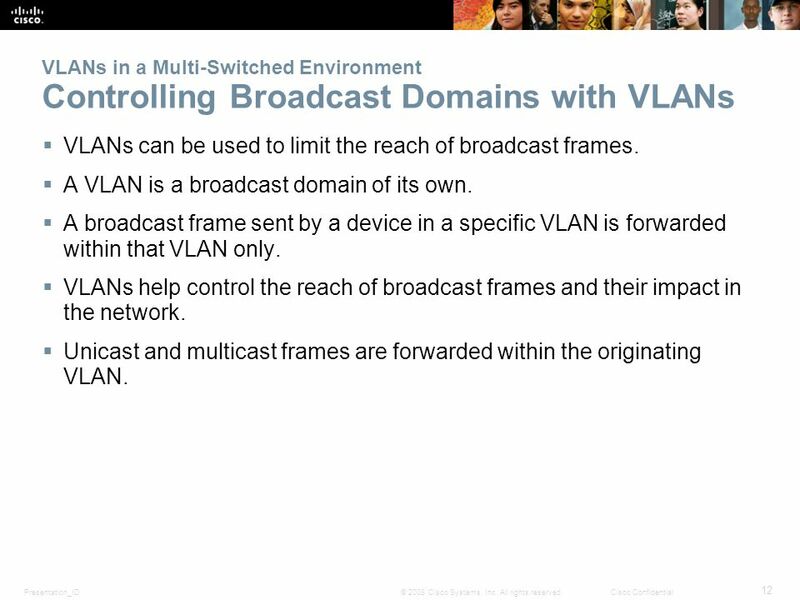 12 Presentation_ID 12 © 2008 Cisco Systems, Inc. All rights reserved.Cisco Confidential VLANs in a Multi-Switched Environment Controlling Broadcast Domains with VLANs  VLANs can be used to limit the reach of broadcast frames.  A VLAN is a broadcast domain of its own.  A broadcast frame sent by a device in a specific VLAN is forwarded within that VLAN only.  VLANs help control the reach of broadcast frames and their impact in the network.  Unicast and multicast frames are forwarded within the originating VLAN. 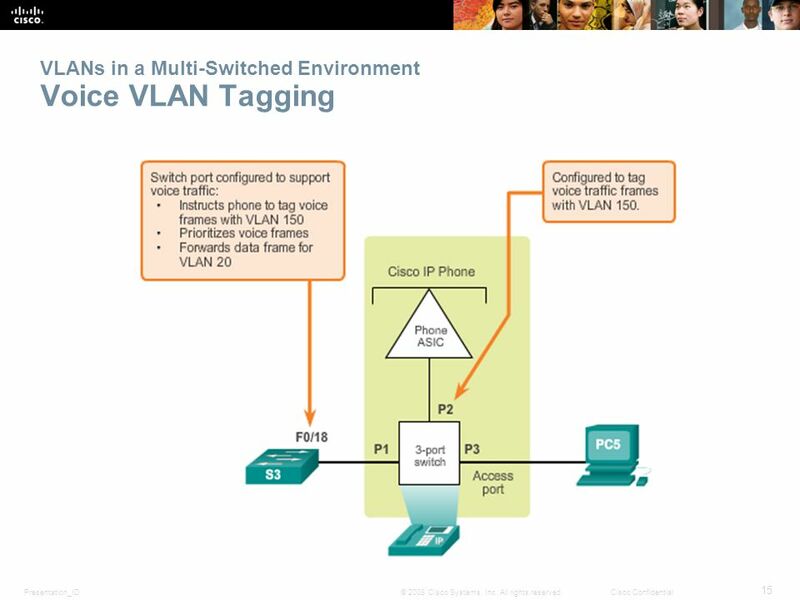 13 Presentation_ID 13 © 2008 Cisco Systems, Inc. All rights reserved.Cisco Confidential VLANs in a Multi-Switched Environment Tagging Ethernet Frames for VLAN Identification  Frame tagging is the process of adding a VLAN identification header to the frame.  It is used to properly transmit multiple VLAN frames through a trunk link. 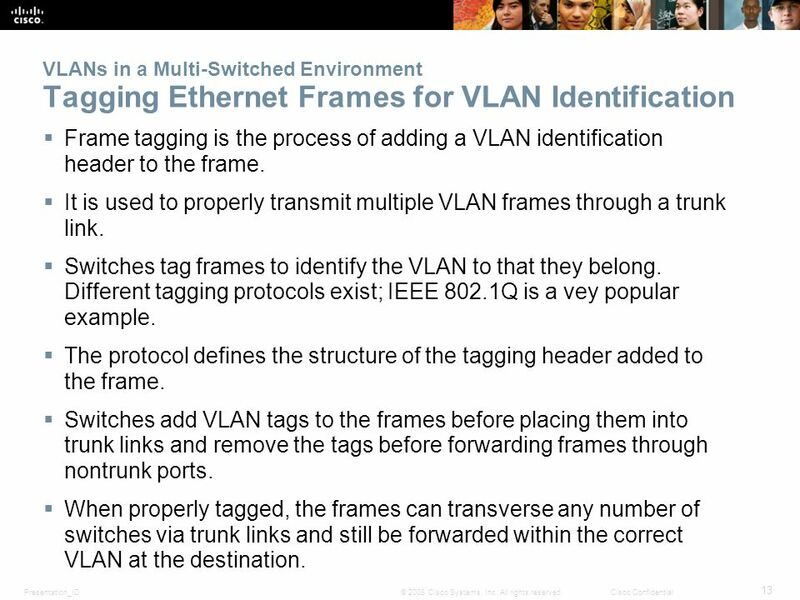  Switches tag frames to identify the VLAN to that they belong. Different tagging protocols exist; IEEE 802.1Q is a vey popular example.  The protocol defines the structure of the tagging header added to the frame. 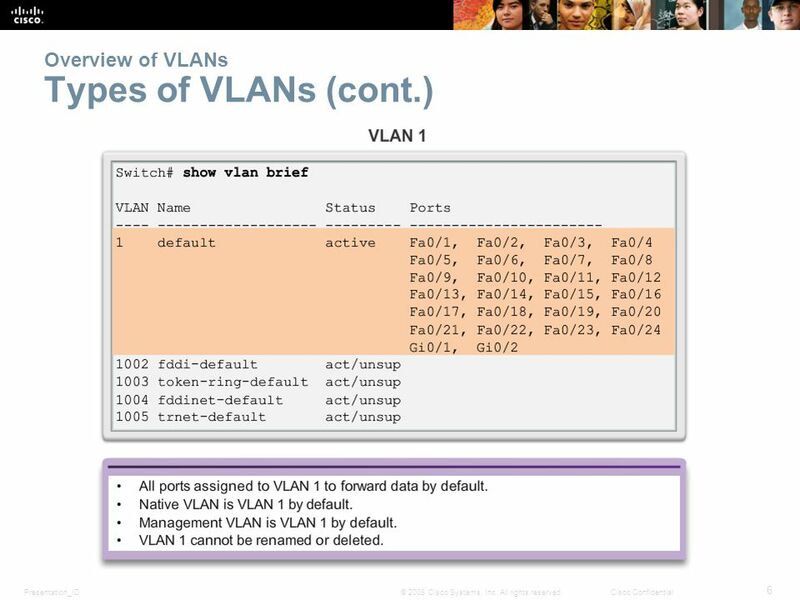  Switches add VLAN tags to the frames before placing them into trunk links and remove the tags before forwarding frames through nontrunk ports.  When properly tagged, the frames can transverse any number of switches via trunk links and still be forwarded within the correct VLAN at the destination. 29 Presentation_ID 29 © 2008 Cisco Systems, Inc. All rights reserved.Cisco Confidential Dynamic Trunking Protocol Introduction to DTP  Switch ports can be manually configured to form trunks.  Switch ports can also be configured to negotiate and establish a trunk link with a connected peer. 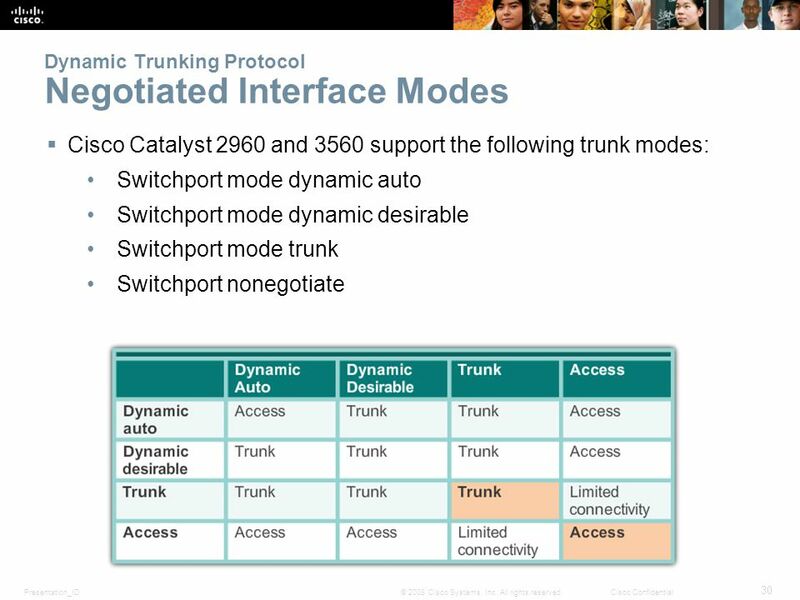  The Dynamic Trunking Protocol (DTP) manages trunk negotiation.  DTP is a Cisco proprietary protocol and is enabled, by default, in Cisco Catalyst 2960 and 3560 switches. 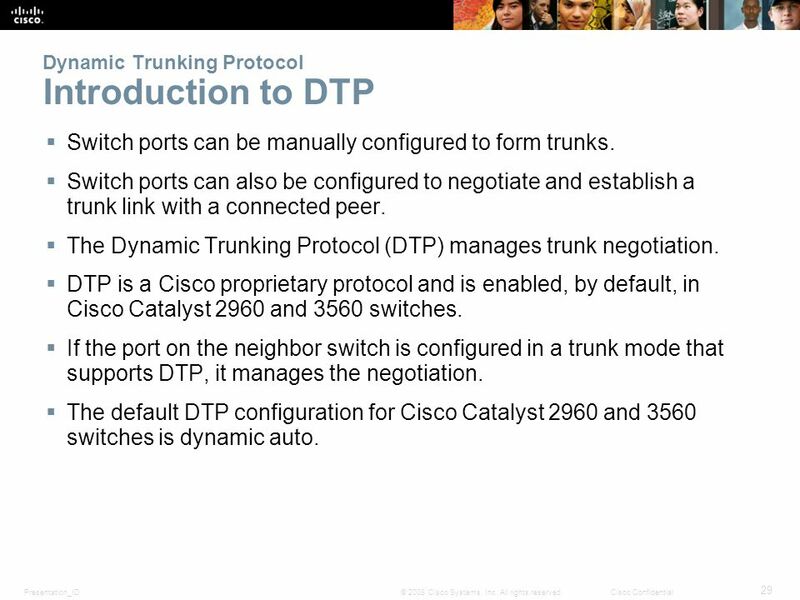  If the port on the neighbor switch is configured in a trunk mode that supports DTP, it manages the negotiation. 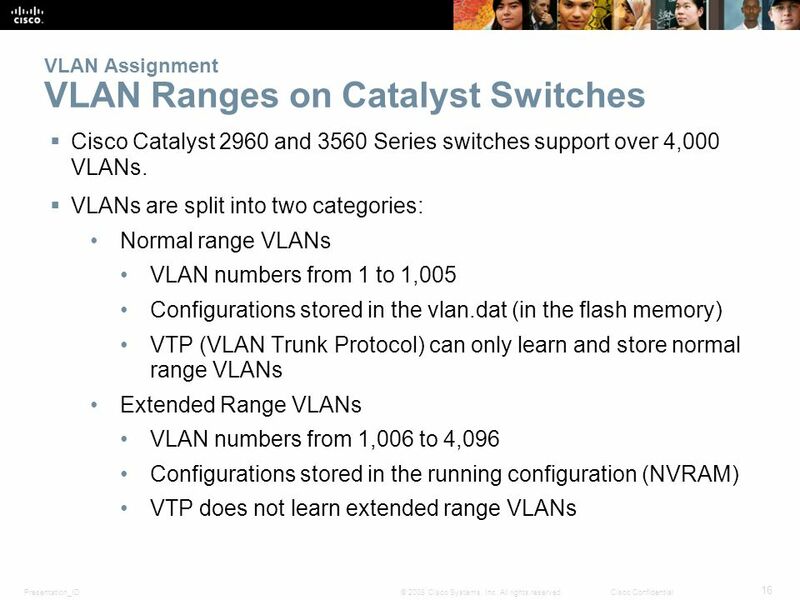  The default DTP configuration for Cisco Catalyst 2960 and 3560 switches is dynamic auto. 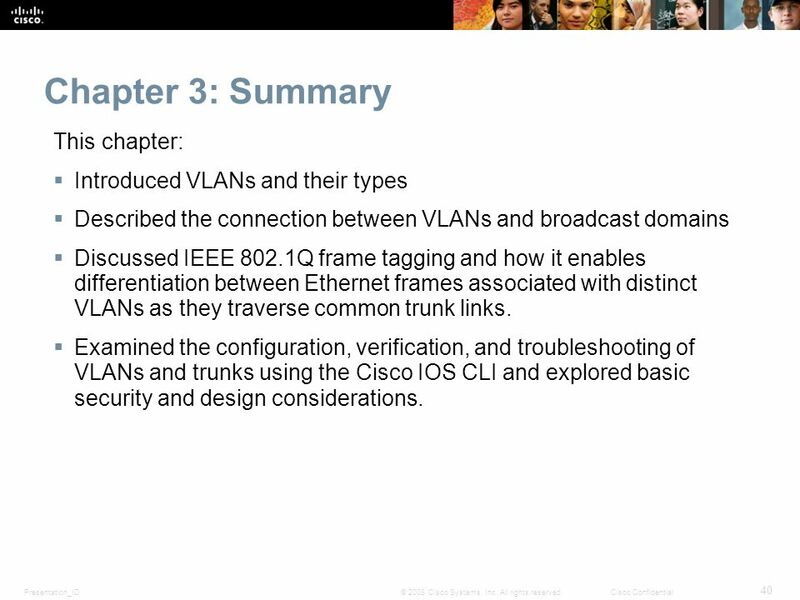 31 Presentation_ID 31 © 2008 Cisco Systems, Inc. All rights reserved.Cisco Confidential Troubleshooting VLANs and Trunks IP Addressing Issues with VLAN  It is a common practice to associate a VLAN with an IP network.  Because different IP networks only communicate through a router, all devices within a VLAN must be part of the same IP network to communicate.  The figure displays that PC1 cannot communicate to the server because it has a wrong IP address configured. 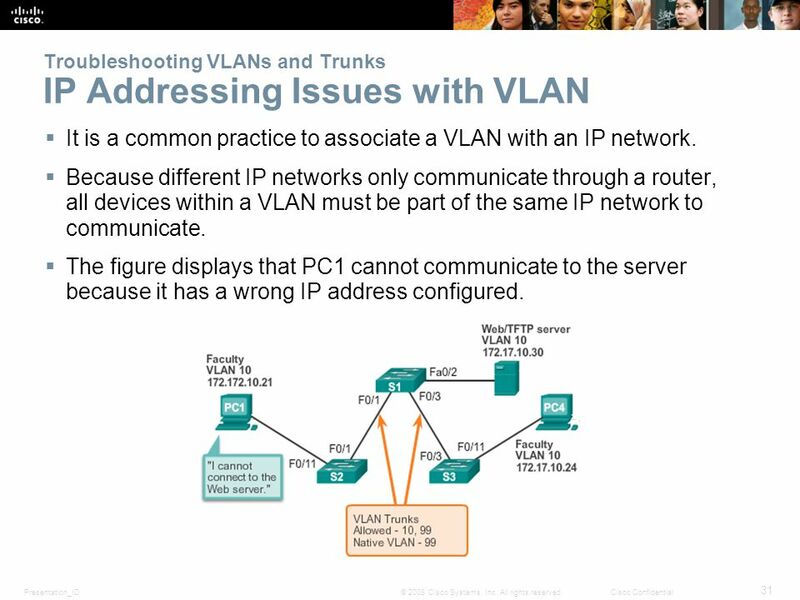 32 Presentation_ID 32 © 2008 Cisco Systems, Inc. All rights reserved.Cisco Confidential Troubleshooting VLANs and Trunks Common Problems with Trunks  Trunking issues are usually associated with incorrect configurations. 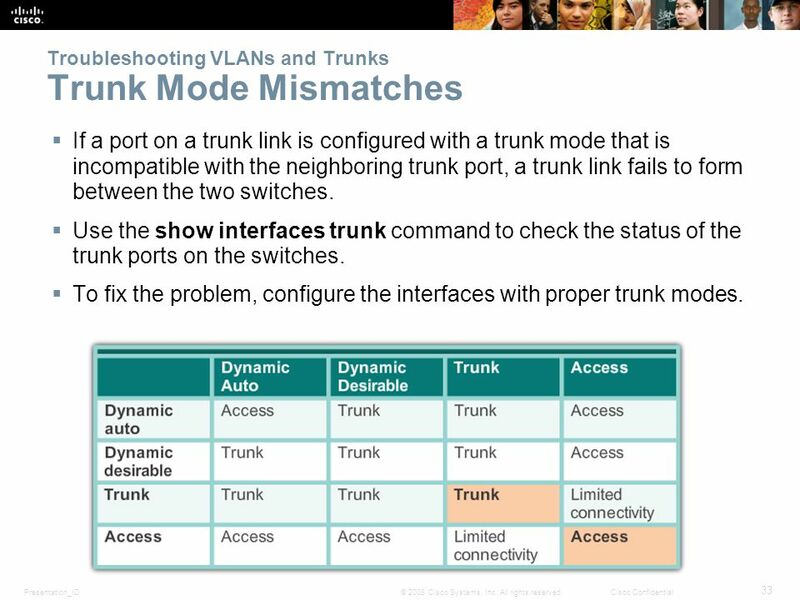  The most common type of trunk configuration errors are: 1.Native VLAN mismatches 2.Trunk mode mismatches 3.Allowed VLANs on trunks  If a trunk problem is detected, the best practice guidelines recommend to troubleshoot in the order shown above. 33 Presentation_ID 33 © 2008 Cisco Systems, Inc. All rights reserved.Cisco Confidential Troubleshooting VLANs and Trunks Trunk Mode Mismatches  If a port on a trunk link is configured with a trunk mode that is incompatible with the neighboring trunk port, a trunk link fails to form between the two switches.  Use the show interfaces trunk command to check the status of the trunk ports on the switches.  To fix the problem, configure the interfaces with proper trunk modes. 34 Presentation_ID 34 © 2008 Cisco Systems, Inc. All rights reserved.Cisco Confidential Troubleshooting VLANs and Trunks Incorrect VLAN List  VLANs must be allowed in the trunk before their frames can be transmitted across the link. 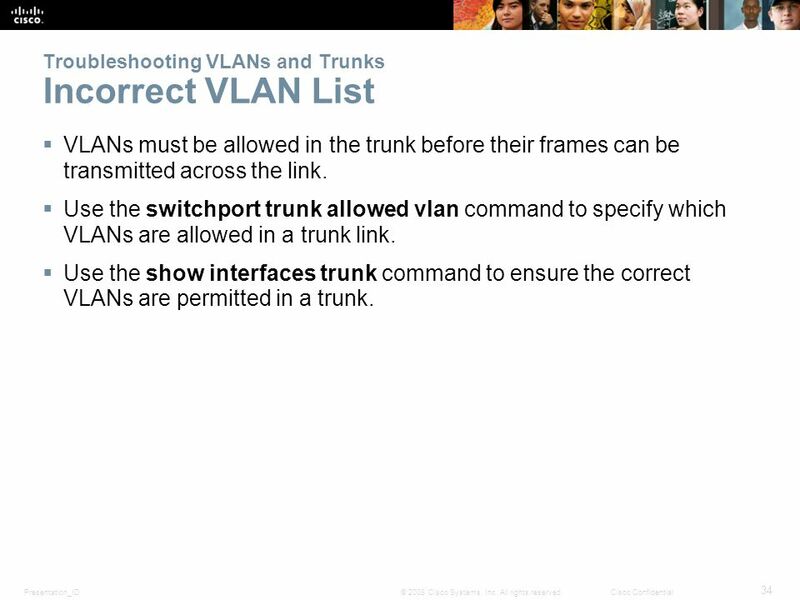  Use the switchport trunk allowed vlan command to specify which VLANs are allowed in a trunk link. 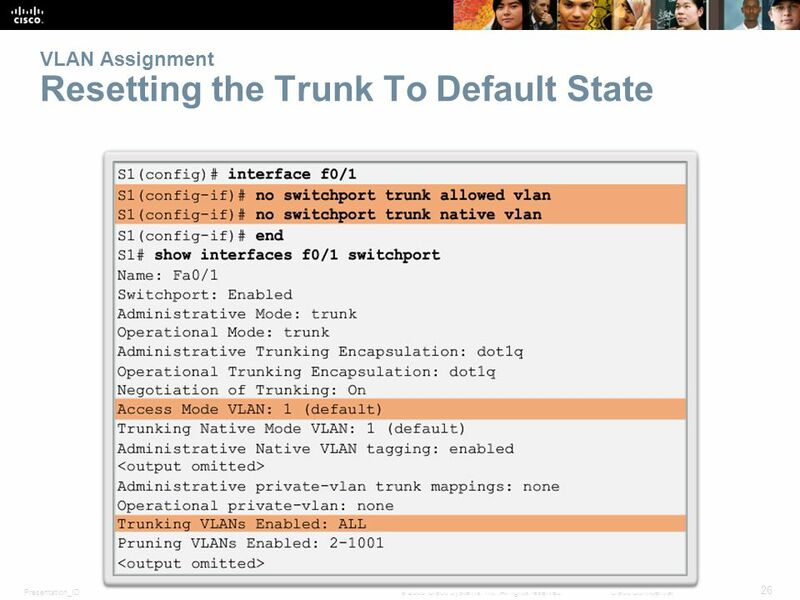  Use the show interfaces trunk command to ensure the correct VLANs are permitted in a trunk. 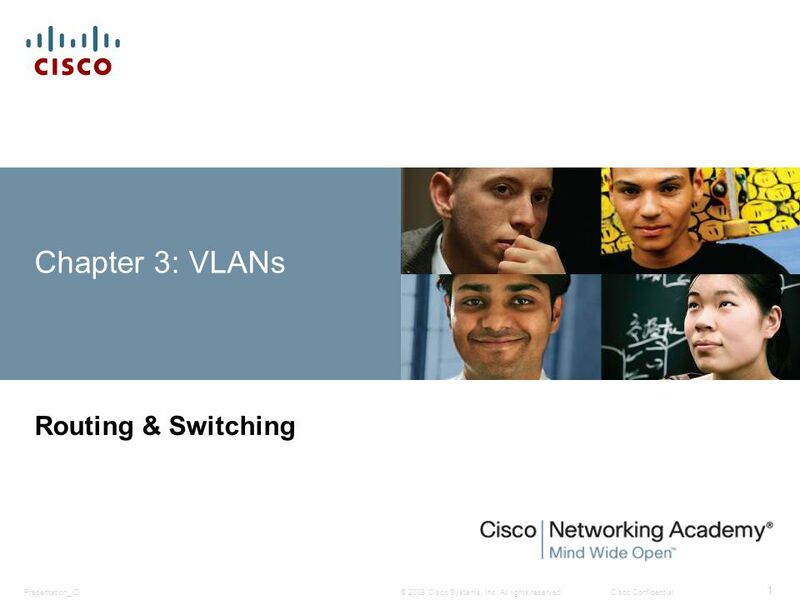 35 Presentation_ID 35 © 2008 Cisco Systems, Inc. All rights reserved.Cisco Confidential Attacks on VLANs Switch Spoofing Attack  There are a number of different types of VLAN attacks in modern switched networks; VLAN hopping is one example.  The default configuration of the switch port is dynamic auto.  By configuring a host to act as a switch and form a trunk, an attacker could gain access to any VLAN in the network. 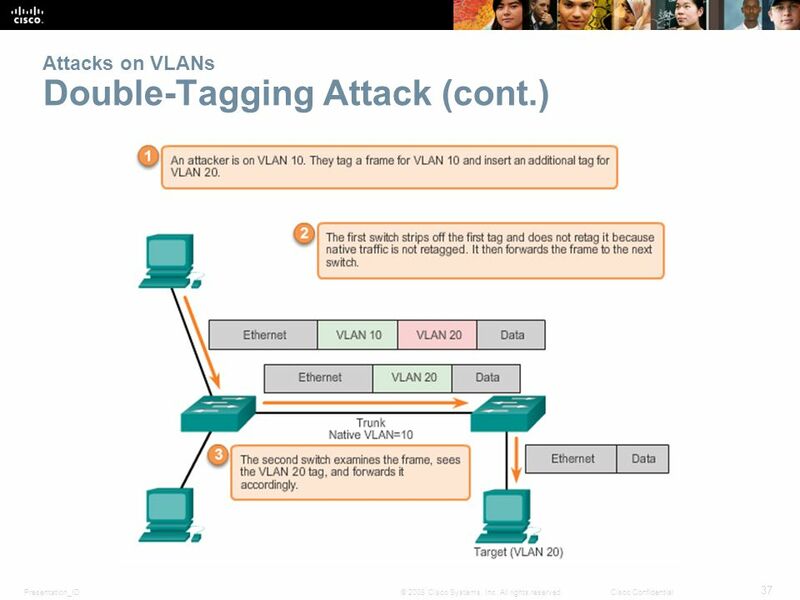  Because the attacker is now able to access other VLANs, this is called a VLAN hopping attack.  To prevent a basic switch spoofing attack, turn off trunking on all ports, except the ones that specifically require trunking. 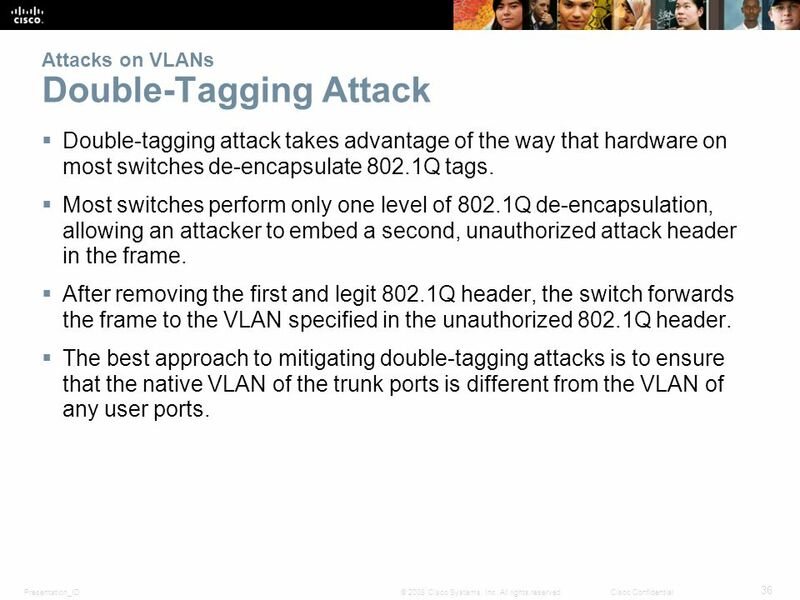 36 Presentation_ID 36 © 2008 Cisco Systems, Inc. All rights reserved.Cisco Confidential Attacks on VLANs Double-Tagging Attack  Double-tagging attack takes advantage of the way that hardware on most switches de-encapsulate 802.1Q tags.  Most switches perform only one level of 802.1Q de-encapsulation, allowing an attacker to embed a second, unauthorized attack header in the frame. 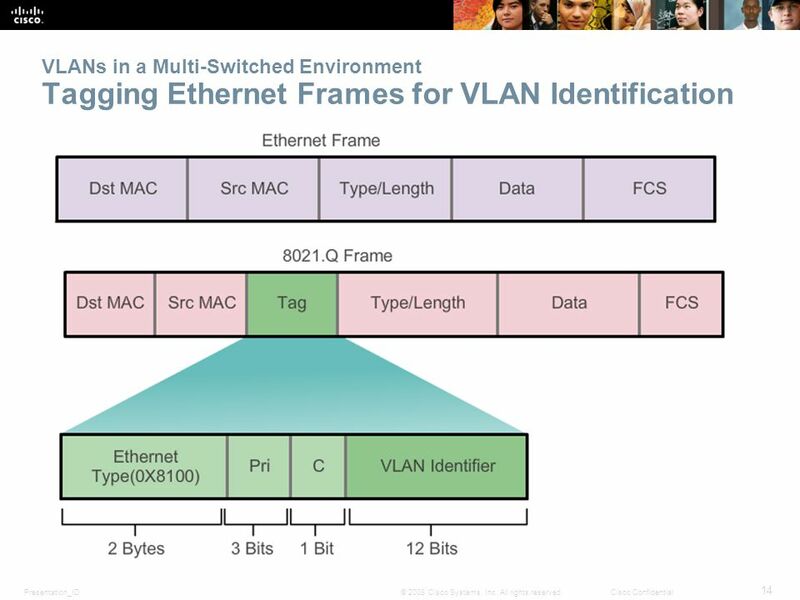  After removing the first and legit 802.1Q header, the switch forwards the frame to the VLAN specified in the unauthorized 802.1Q header.  The best approach to mitigating double-tagging attacks is to ensure that the native VLAN of the trunk ports is different from the VLAN of any user ports. 38 Presentation_ID 38 © 2008 Cisco Systems, Inc. All rights reserved.Cisco Confidential Attacks on VLANs PVLAN Edge  The Private VLAN (PVLAN) Edge feature, also known as protected ports, ensures that there is no exchange of unicast, broadcast, or multicast traffic between protected ports on the switch.  Local relevancy only.  A protected port only exchanges traffic with unprotected ports.  A protected port does not exchange traffic with another protected port. 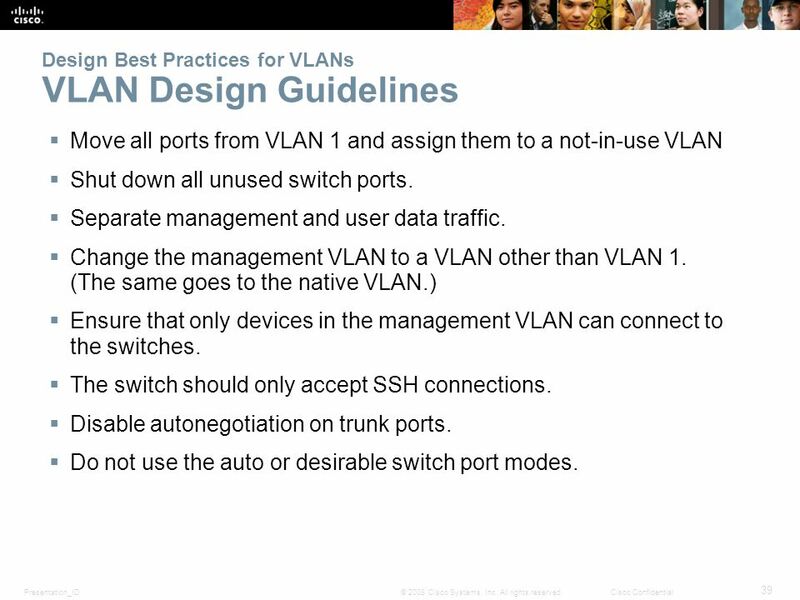 39 Presentation_ID 39 © 2008 Cisco Systems, Inc. All rights reserved.Cisco Confidential Design Best Practices for VLANs VLAN Design Guidelines  Move all ports from VLAN 1 and assign them to a not-in-use VLAN  Shut down all unused switch ports.  Separate management and user data traffic.  Change the management VLAN to a VLAN other than VLAN 1. (The same goes to the native VLAN.)  Ensure that only devices in the management VLAN can connect to the switches.  The switch should only accept SSH connections.  Disable autonegotiation on trunk ports.  Do not use the auto or desirable switch port modes. 40 Presentation_ID 40 © 2008 Cisco Systems, Inc. All rights reserved.Cisco Confidential Chapter 3: Summary This chapter:  Introduced VLANs and their types  Described the connection between VLANs and broadcast domains  Discussed IEEE 802.1Q frame tagging and how it enables differentiation between Ethernet frames associated with distinct VLANs as they traverse common trunk links. 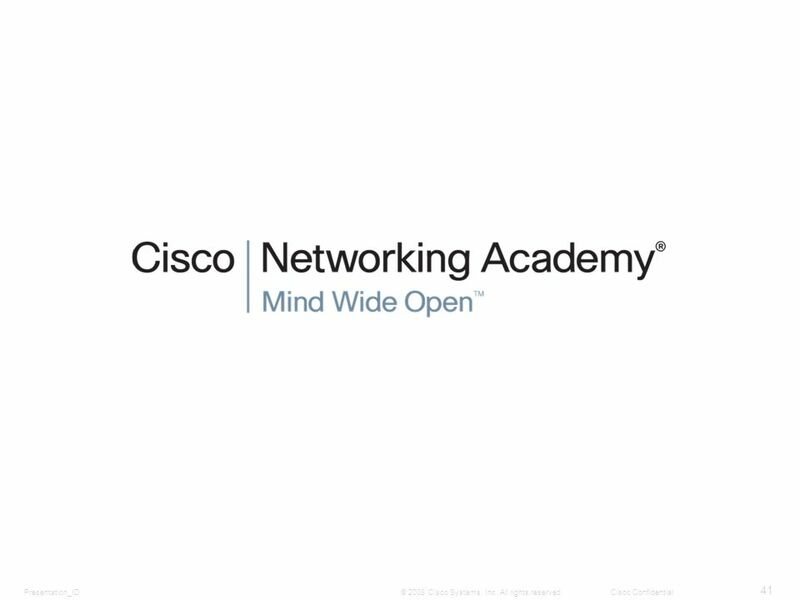  Examined the configuration, verification, and troubleshooting of VLANs and trunks using the Cisco IOS CLI and explored basic security and design considerations. 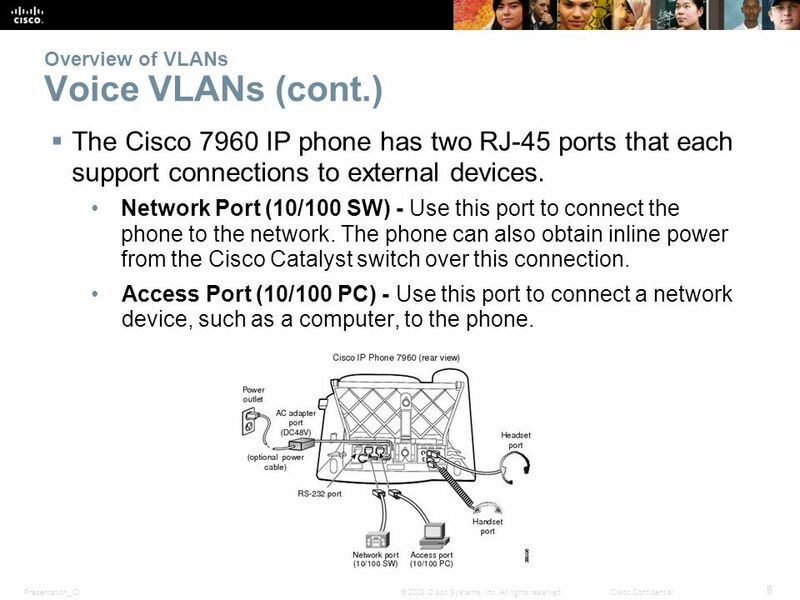 Download ppt "© 2008 Cisco Systems, Inc. All rights reserved.Cisco ConfidentialPresentation_ID 1 Chapter 3: VLANs Routing & Switching." © 2006 Cisco Systems, Inc. All rights reserved.Cisco Public 1 Version 4.0 VLANs LAN Switching and Wireless – Chapter 3. © 2006 Cisco Systems, Inc. All rights reserved.Cisco Public 1 Version 4.0 Implement VTP LAN Switching and Wireless – Chapter 4. 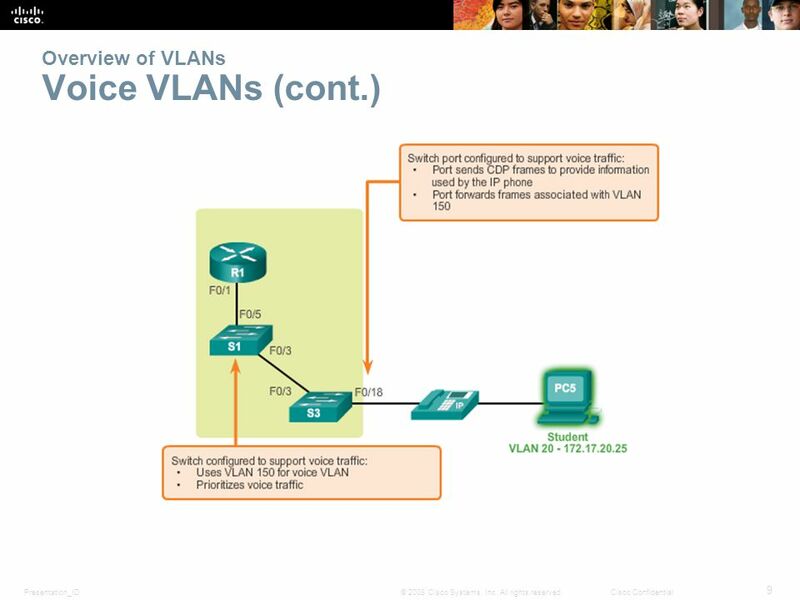 © 2008 Cisco Systems, Inc. All rights reserved.Cisco ConfidentialPresentation_ID 1 W. Schulte Chapter 5: Inter-VLAN Routing Routing And Switching. 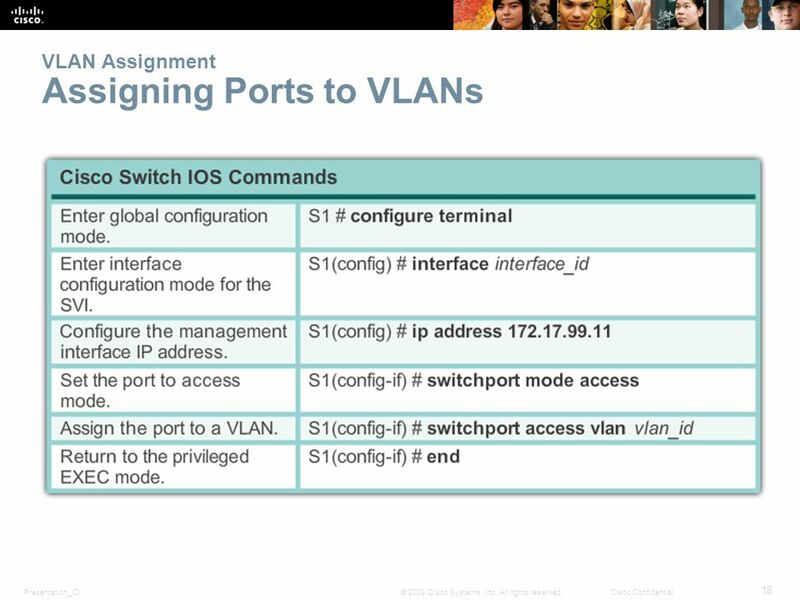 © 2008 Cisco Systems, Inc. All rights reserved.Cisco ConfidentialPresentation_ID 1 Chapter 5: Inter-VLAN Routing Routing & Switching. Layer 2: Redundancy and High Availability Part 1: General Overview on Assignment 1. © 2006 Cisco Systems, Inc. All rights reserved. ICND v2.3—2-1 Extending Switched Networks with Virtual LANs Configuring VLANs. 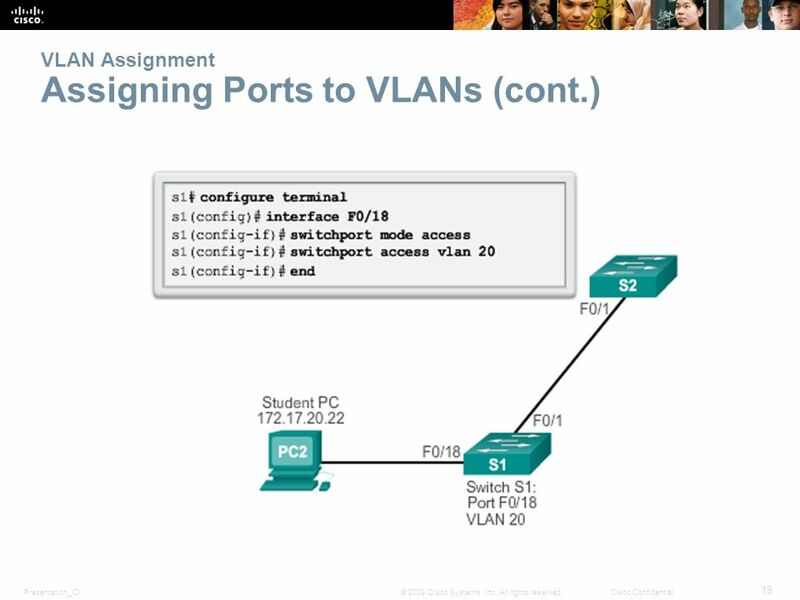 CCENT Study Guide Chapter 11 VLANs and Inter-VLAN Routing. W&L Page 1 CCNA 200-120 CCNA 200-120 Training 2.7 Configure and verify trunking on Cisco switches Jose Luis Flores / Amel Walkinshaw Aug, 2015.